The Victoria Mandolin Orchestra is looking forward to playing our Spring Delights concert series in April 2019 at local seniors' residences. From August 3-9 2019 the German Langendorf Mandolin Orchestra visits our city. We are very exciting to be hosting this dynamic and youthful orchestra again. Their visit in 2015 was an inspirational cultural exchange. 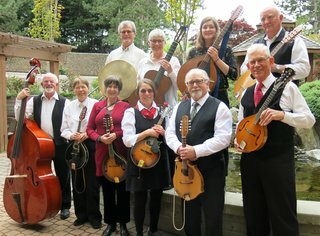 Victoria Mandolin Orchestra was founded in 1995 by the late Patrick Lawson. Kate Rhodes is our current conductor. Our repertoire includes baroque, classical, traditional, contemporary, movie themes and popular music. Instruments include mandolins, octave mandola, mandocellos, bass, guitar and percussion. Our active group, numbering around ten, enjoy entertaining at summer fairs and markets. The orchestra performs at seniors' facilities throughout Victoria. We welcome new members at the intermediate level who read music (treble and bass clef). We practice on Tuesday evenings, 7-9PM.